We have been fishing the local bay system around Port Aransas Texas for over 10 years and have mastered these waters. If you are coming to Port Aransas for vacation or work this is a great opportunity to get out on the water and enjoy what many consider the best fishing on the Texas coast. Port Aransas is just one of the 6 small towns we serve. From the shallows of Light House Lakes to the Lydia Ann Channel and the oil rigs just off shore the Port Aransas offers some of the best fishing trips money can buy. 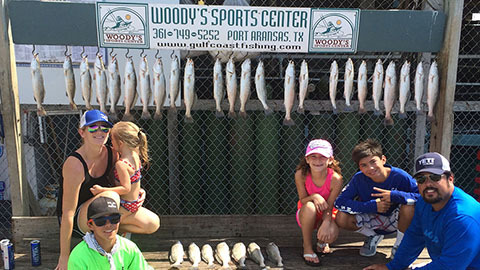 If you are after Redfish, Trout and flounder it is almost a guarantee you will find them in Port Aransas all year. You can also find some Spanish Mackerel, Red Snapper and Jack Caravel when luck strikes. 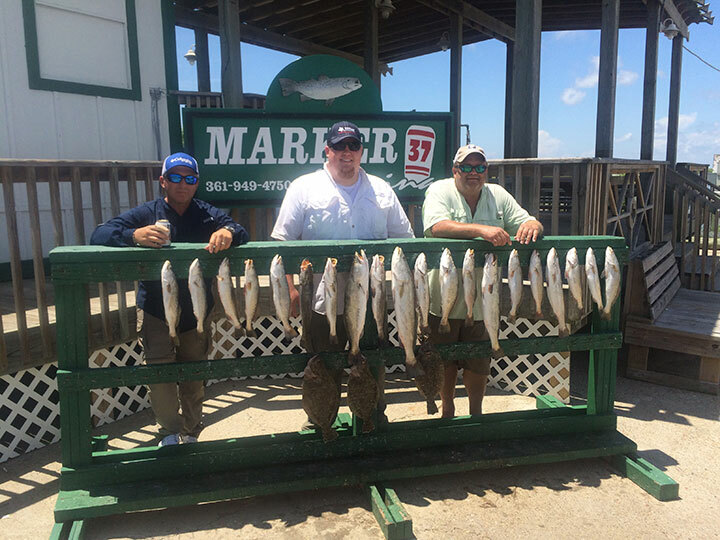 The best part about fishing Port Aransas is it offers all types of fishing from deep channels, grass flats, mud flats, oyster reefs, and hard sand bottoms for wade fishing if it is the way you enjoy fishing it can be found here. From the beautiful scenery to the amazing island culture and atmosphere you truly cannot go wrong. If you would love to experience the beauty and fishing excellence that is Port Aransas Texas and you want more information about the area and the services that our company provides in that area then follow this link Port Aransas Texas Fishing Guide Info. Rockport Texas is one of the primary cities we offer our fishing guide service in. Our main office is located only 20 minutes away but with all the fishing action and demand for fishing trips in Rockport Texas we knew we had to open an office there. Surrounded by Copano Bay and Aransas Bay Rockport Texas is home to some of the best fishing in the entire coastal bend. Copano Bay is a primary back bay to our local bay system and with the fresh river water dumping into it during the spring and the fall it is a primary location for the white and brown shrimp spawns. This leads to thick and fast redfish and trout catching action. Also with the San Jose Island to the east is help protect the bay from the wind allowing the sea grass to thrive along with the other laws that have been put into place to protect it. Rockport Texas has a rich history consisting of fishing and Texas history. Rockport is located on the Live Oak Peninsula and its name was derived from the rock ledge that wraps along its shore. This rock ledge creates a great habitat for the fish to bread and grow and has made Rockport the fishing community it is today. If you would love to experience the area and fishing excellence that is Rockport TX and you want more information about the area and the services that our company provides in that area then follow this link Rockport Texas Fishing Guide Info. We also have a fishing guide branch located in Corpus Christi Texas. This part of the gulf coast is a one of the pieces that makes up the best gulf coast fishing area in Texas. From the marshes drains behind San Jose Island to the amazing grass flats in the Upper Laguna Madre and the famous Baffin Bay Rocks that hold record breaking trout the Corpus Christi area boast some of the best fishing. Depending on the person Corpus Christi Texas fishing will either be bragged about loudly or keep quite Texas secret. The bays around Corpus Christi are well known for the huge amount of shallow flats all of them protected from the Gulf of Mexico by a group of barrier islands. The Corpus Christi Bay system is made up of 4 bays the San Antonio Bay, the Aransas Bay, the Corpus Christi Bay and the Upper Laguna Madre. Each bay has its own locations and tricks to finding the most and highest quality fish but all of them offer great fishing all year. The most sought after fish species in our bay system are redfish, speckled trout, black drum, flounder and sheepshead. The most common bait used to catch these fish include mullet, pig perch, croaker, shad and shrimp. If you would love to experience the area and excellent fishing around Corpus Christi TX and you want more information about the area and the services that our company provides in that Corpus Christi then follow this link Corpus Christi Texas Fishing Guide Info. 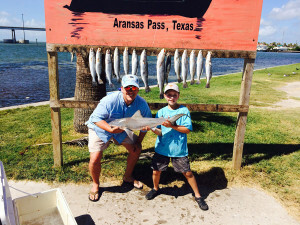 If you’re looking for Aransas Pass TX Fishing Charter you have come to the right place. I’m Captain Eddie Jenkins and I’m the owner of and one of the guides for Ingleside Fishing Charters. If you are looking for a professional fishing guide to take you out around Aransas Pass Texas you can stop your search now and call us 361-816-0397, because you have found the best. Known to be one of the best fishing destinations on the coastal bend Aransas Pass has great fishing all around it year round. If you want to catch Redfish (Red Drum) in the flats and off the oyster reefs then you have come to the right area. Between the Dagger Flats, Hog Island, South Bay, Redfish Bay, Stedmen Island and Ransom Island there is no shortage of places to find Redfish. If Speckled Trout (Sea Trout) are what you are after the Lydia Ann Channel, Dagger Island, Morris and Cummings Cut, Shellbank Island and Pelican Island have some of the best speckled trout fishing on the Texas Coastal Bend. There is a few boat ramps we can use in the area to get to the right spots and make sure we maximize our time fishing and not driving around. Conn Brown Harbor Park is the primary boat ramp we like to use but there is also Ransom Park and Boat Ramp as well as Tarpon Shores boat ramp. Between these 3 boat ramps we can make sure we are have the shortest drive and the smoothest ride depending on the weather. If you would love to experience the area and excellent fishing around Aransas Pass TX and you want more information about the area and the services that our company provides in there then follow this link Aransas Pass Texas Fishing Guide Info. Portland Texas is a small coastal town that sits between Nueces Bay and Corpus Christi Bay and is well known as a central location to all the hot fishing areas in the Texas coastal bend. Sunset Lake Park is on the way out of Portland TX driving towards Corpus Christi TX. This lake is trapped by land except for 1 drainage tunnel that travels under the 181 cause way. This creates an environment that breeds some of the largest trout and redfish in the area. Once they get into Sunset Lake there are essentially stuck and have a food source all to themselves. Also nearby is the Portland Shoreline that takes the force of the southeast wind and consistently forces bait fish and small plants into the area. It has a hard sand and shell bottom and concrete barriers protecting the shorelines from the wind creating some of the best fishing structure. The Portland Shoreline is a hot spot for wade fishing for trout all year long and is loved by kayak fishers also. On the north side of Nueces Bay is the recently made man made fish habitat behind what used to be Gunderland Marine this area is thriving with redfish and trout in the guts that run between these islands. It has a very muddy bottom which is great for shrimp and in turn creates one of the best locations around to fish for redfish and flounder. If you would love to experience the area and excellent fishing around Portland TX and you want more information about the area and the services that our company provides there then follow this link Portland Texas Fishing Guide Info.